Completion Date: Planning submitted September 2018.Proposed completion summer 2019. Our team at Croft Architecture has won a contract to work with Stoke-On-Trent City Council to design a new affordable housing project in the heart of the city. We were successful with our scheme after carrying-out a feasibility study on the Norfolk Street site in Shelton. The site was once home to a pottery factory which provided a base for several companies over the centuries. As the pottery industry began to decline in the late 90’s so too did the need for premises to manufacture ceramics in Stoke-On-Trent. The former factory has since been demolished leaving an empty site. The land is an ideal blank canvas to transform the site into a new development of homes that will help to address the demand for affordable housing and to regenerate the area. The site already had planning consent to build 20 new homes, but at the time the former land owner didn’t see the development as being financially viable. Our brief from the City Council was to develop the redundant city centre site by sensitively increasing the number of new high-quality affordable homes within their determined budget and timescales. By increasing the number of properties, it would, not only boost the quantity of much needed quality affordable homes in Stoke-on-Trent, but also maximise the City Council's investment on the site. In the 19th century Stoke-On-Trent was a thriving industrial city famous for the production of pottery. The area grew in notability thanks to the skills of master potters such as Josiah Wedgwood and John Spode who developed new ceramic manufacturing techniques that changed the way that the wares were produced. Another significant feat of the industrial revolution led by a Staffordshire engineer, was the birth of the canal age, which facilitated the growth of the pottery industry in Stoke-On-Trent. James Brindley of Leek, Staffordshire, had focused his early career on building and repairing mills in the area, where he learnt how to control water flows. The quality of his work projected him to gain recognition from those of significance within his industry and people of notability. In fact, Brindley caught the attention of the Duke of Bridgewater, who was struggling to transport coal from his mines in Worsley to the industrial areas of Manchester. Brindley was commissioned by the Duke to create a solution which led to the start of the Bridgewater Canal. At the time this was a pioneering feat and the waterway became recognised as the first still-water canal in Britain. Spotting an opportunity to transport goods more cheaply and efficiently from his factories in Stoke-On-Trent, industrialist Josiah Wedgwood became an early advocate of canals and fought hard with Brindley for their construction. Brindley’s work was enormously important to the pottery industry in Stoke-On-Trent with creation of the Trent and Mersey canal and Caldon Canal. The effective and efficient transport system allowed industries such as pottery manufacturing to grow significantly in Stoke-On-Trent and manufacturing throughout the country. The canal side site on Norfolk Street, Shelton, is part of the wider Cauldon Canal Conservation Area, which was first designated in 1994. The canal runs around sixteen miles east to west through Stoke-on-Trent along the River Trent valley. In its heyday the canal enabled the development of industry throughout Staffordshire towns, including steel and iron works, coal mining and ceramics, facilitating Stoke-on-Trent's significance as a global centre for ceramic production. The site was previously occupied by a number of pottery works over a period of time with the first factories dating as far back as 1879. The pottery buildings were still present in 1994 but by 2003 they had been completely removed and the site then stood vacant, apart from some derelict buildings which were subsequently removed in 2012. The empty plot is situated next to Shelton Primary Care Centre which was completed in 2012 and the City Council’s site has remained vacant and undeveloped since then. The redundant brownfield site had already received planning permission for a development of 20 new dwellings, however, upon meeting with our client and surveying the plot, we could see that the site had the potential to accommodate extra new dwellings, whilst improving the overall design and layout of the scheme. The benefits of re-working the layout and design would not only vastly maximise the use of our clients determined budget, but also increase the number of much needed affordable new homes. The revisions to scheme would now economically utilise the space of the vacant site within a sustainable location. Our team were conscious that our client has a determined budget and time frame that the project must adhere to in order for them to maintain the funds for the project and to swiftly accommodate local people in their new homes. There is a strong need for affordable social housing across the city. Shelton is an area of Stoke-On-Trent where there is a significant number of people waiting for a home in comparison to rest of the city. 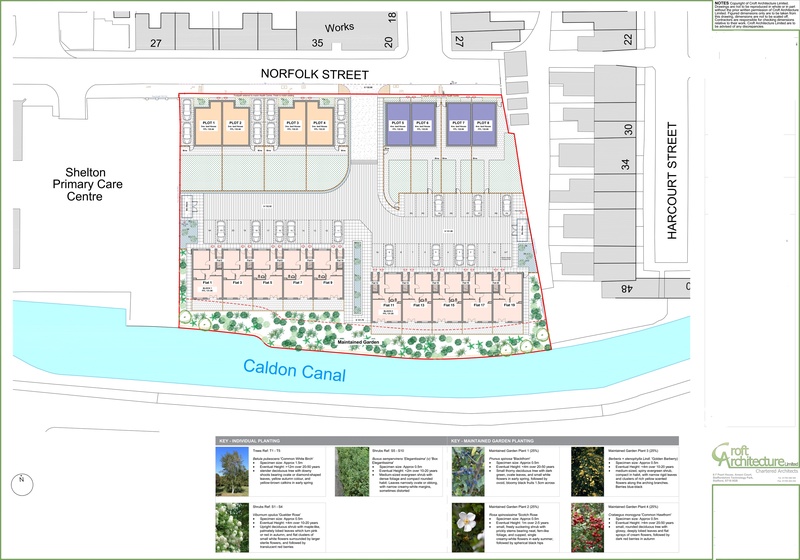 The redevelopment of Norfolk Street aims to restore the integrity of an empty plot, reconnecting the existing neighbourhood with a new community whilst conserving the sites importance in local history next to the canal. By replacing the former pottery works with a new small community of housing we are preserving the character of the street scene within Shelton’s conservation area. The project sits in the historic core of Stoke-On-Trent’s regeneration and conservation area, so careful design consideration has been given to sensitively transform the new dwellings. Following our assessment of the site and its historical background we identified several constraints associated with the planned development that we needed to take into consideration within our design proposal. There is a 6 metre construction free standoff zone next to the canal. The site falls within the Cauldon Canal Conservation Area. Consideration of the local character and context. The sites proximity of the nearby surrounding houses. The need for piling solution stone for the new build dwellings. The Cauldon Canal flows past one side of the site and touches the proposed land on it’s flank. Due to the proximity of the site in respect of the canal there is a 6 metre no build zone from the edge of the canal. The construction free zone has been incorporated into our design proposals. To make the most efficient use of the 6 metre space we have included a proposed wild garden within this area. The landscaping will seamlessly connect the site with its canal side location, attractively blending the waterside to the development and preventing an abrupt convergence between the two. The garden area ensures that our design adheres to regulations whilst creating a natural appearance that’s aesthetically pleasing and provides additional amenity space to the residents. We’ve also created private garden space to the front and rear of the new homes, providing a buffer to the edges of the new development. The garden space also helps to bring together the well-established street with the new homes. We’ve also included some additional public amenity space and landscaping areas for the new residents. The inclusion of the open spaces and garden areas in our design proposal aims to provide a varied and interesting new housing development that connects well with the existing street-scape. Our design intent is to enhance the neighbourhood by creating new social spaces that will character and nature of the area. 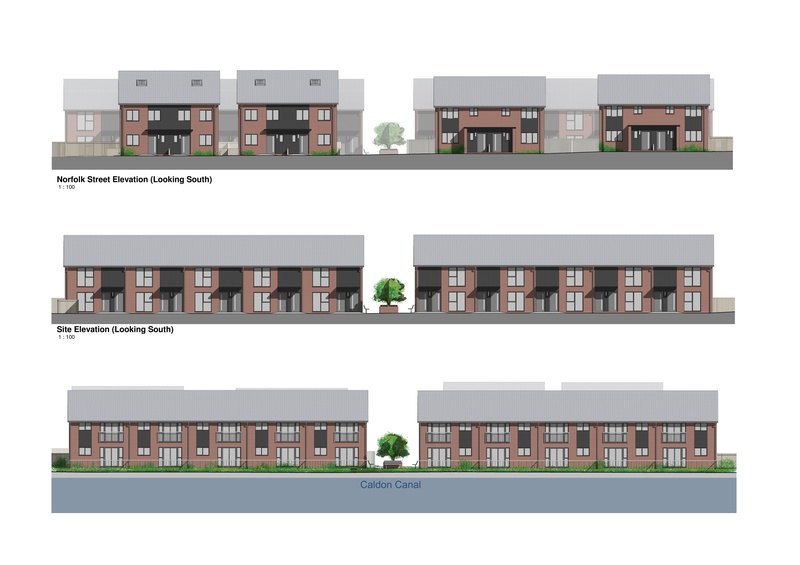 Although the land had been purchased with planning consent for 20 dwellings, we could see that the site had the potential to accommodate additional new homes, whilst improving the overall design and layout of the scheme within accordance to the conservation criteria. We knew that the historical features of the site had already been lost with previous site clearances and demolitions. In its current state the site contributed nothing to the local Conservation Area or the residents of Norfolk Street. The is a withdrawn environment that’s potentially unsafe and visually unattractive to view. Our teams’ new scheme to redevelop the site has a compound of benefits which include the provision of new affordable homes to rent or buy for the local community and the regeneration of a derelict site into a safe and welcoming, attractive environment. The plans aim to provide a new residential development for Norfolk Street consisting of 28 new affordable homes, with 20, 1- bedroom apartments, 4 semi-detached 3-bedroom houses and 4 semi-detached 4-bedroom houses with private parking and amenity space for all new residents to enjoy. We have considered the proposal of the new 28 properties in relation to urban context and the immediate environment of area which is characterised by terraced streets that have a high sense of enclosure. Our new design makes an efficient use of a sustainable brownfield site whist accommodating appropriate levels of private and communal spaces with on and off-street parking. Although the site is in a conservation area our team have given special consideration to the new-build proposals. The new dwellings have been designed to respond to the character of the local area incorporating details and materials to reflect this. They are sensitive and contextual to the existing properties, yet they have been injected with a modern twist to embrace a connection with the era in which we currently live. Even though the site on the edge of the Cauldon Canal has presented design challenges, it’s also created a multitude of opportunities to embrace the canal side locality. The waterfront position offers new home owners the benefit of immediate canal side views. 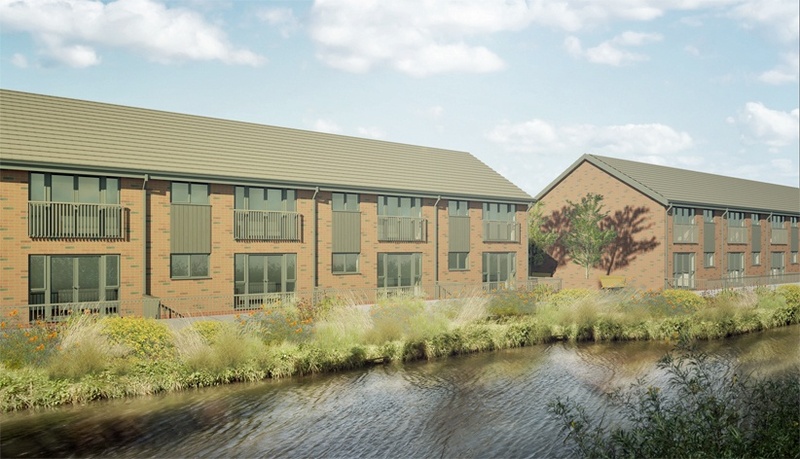 We have utilised the location within the overall design concept too, by providing open communal garden space within the 6 metre no build zone next to the canal and views through the development to improve connections between the local community and the canal. Our new housing proposal will provide 100% affordable or social rent housing and will significantly transform the derelict site for the existing neighbouring community. It is our intention through the construction that the selected contractor will enter the ‘considerate contractors’ scheme’, encouraging a reduction in site waste through reuse and recycling initiatives. We have selected a consistent number of building materials which will help reduce individual deliveries, bespoke products and wastage. The materials will be based on their robustness to reduce maintenance issues and the will be sourced locally wherever possible. A strong working relationship between our team and our client, City of Stoke on Trent Council, has enabled us the rapidly propel the project forwards within a short time frame to submit for planning. We helped our clients consider the design solutions available before arriving at the final design proposal which we submitted for planning. The chosen design solution is the best scheme for the development given the location, the intended tenancy and mix of the units. The scale and size of the new community along with the characteristics of the surrounding area are perfectly suited for this new affordable housing project. Although the number of new homes on the site has increased, careful design consideration was given to modify the design to ensure that the new affordable housing relates to the historical context, style and character of the neighbouring properties dating back to the 1800’s. The use of traditional materials and details will create a strong sense of place and identify with the current neighbourhood, knitting the development into the local community. The design proposal will positively impact upon the local character of the area, transforming a brownfield site that’s currently unused, unsightly and unsafe to provide 100% social housing. This provides excellent prospects for the future of the area, as well as huge benefits for the local community in terms of new diverse and modern homes. Our team have submitted the scheme to be considered for planning approval in September 2018. We trust that our proposal will be fully supported and approved by the local authority to help supply new high quality, affordable housing and to support the overall regeneration of the City of Stoke-On-Trent. Why not subscribe to our blog to be the first to here about the projects' development?